Here is just recently uploaded a short clip of "At the End of the 20th Century". 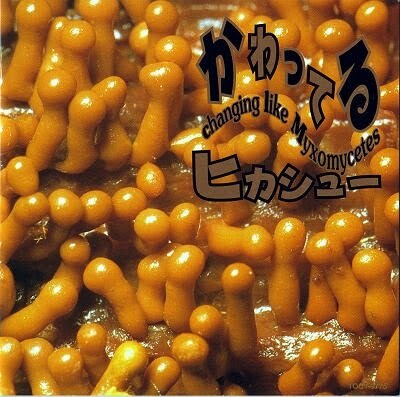 It is for promoting the 1996 album, Kawatteru (Changing Like Myxomycetes). The album is a sort of the best, entirely consisted of the old favorites of the band. All the tracks are completely re-arranged and re-recorded. The version of "20th Century" featured additional musicians, four drummers playing together, for fattening the rhythm. Here you could listen to the edited down, short version of the track. 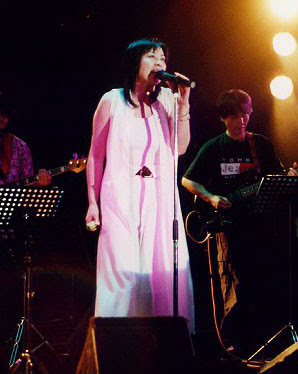 At that time, Hikashu was Makigami Koichi (vocal, cornet), Mita Freeman (guitar), Sakaide Masami (bass), Nomoto Kazuhiro (reeds), Torsten Rusch (sampler), Yoshimori Makoto (keyboard), and Niida Kozo (drums). Bridge Inc., the distributor of Hikashu albums, officially announced that the release date of "Watashi No Tanoshimi" ("My Pleasure") is August 20, 2010. It is basically an instrumental album and intended for fashion show of designer, Jurgen Lehl. It was released in 1984 and have never been reissued before. Originally it was a picture record, each side featured a photo of Planet Earth and the moon. It will be reproduced for the CD reissue - I don't know how but it is possible, at least so told am I. Also it comes with cardboard sleeve replica of original LP artwork. And two bonus tracks will be added. Both are unreleased recordings from the same session. Of course it is remastered, using high resolution 5.6MHz DSD technology. HMV Japan already listed the album. See Here. 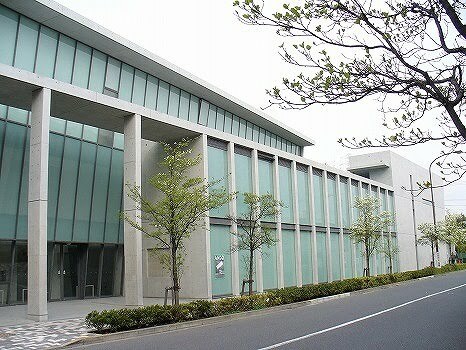 And there will be a concert held at Kichijoji Star Pine's Cafe for commemorating the reissue (and the Fuji Rock appearance) in late August, with various guests including Inoyama Land. More details on this to follow. 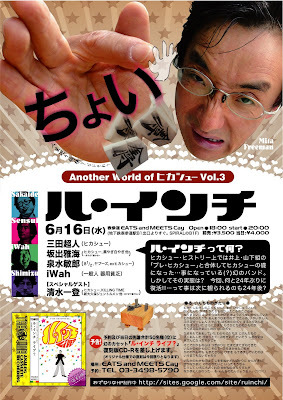 As already announced here, the band "Lu Inchi" (or "Ru Inchi") will play on June 16, 2010 at Aoyama Cay, Tokyo. It will be the first performance for them in 24 years. Lu Inchi is the one of the forerunners of Hikashu. Circa 1976, Makigami Koichi, Mitama Masamichi (later to be known as Mita Freeman) and Tobe Satoshi formed a band and they gave themselves the name. At first, they were just playing for fun and didn't perform in public. 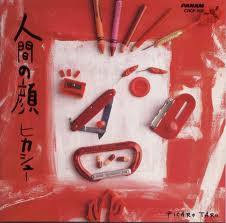 The band resurfaced in 1980 as a side project of Hikashu. For the resurrection, Makigami and Tobe were no longer a regular and it became Mitama's project. There were many formations but mainly, the band consisted of Mitama (vocal, guitar), Sakaide Masami (bass, vocal), Sensui Toshiro (drums, vocal) and iWah (perc, guitar, bass, vocal) plus various guests. 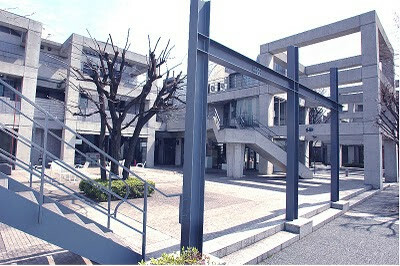 Sensui resigned Hikashu in 1983 but after that he stayed with Lu Inchi. iWah is a long-time friend of the Hikashu members. In the 2010 performance, the personnel is the same plus Shimizu Kazuto (keyboard, bass clarinet) as a guest. So what kind of music they play, you ask? Sorry - having never had a chance to listen their stuff for myself, I cannot tell what their music is like. What I could tell you that it has been said that the satirical, humorous element of Hikashu came from Lu Inchi. That sounds pretty interesting, doesn't it? 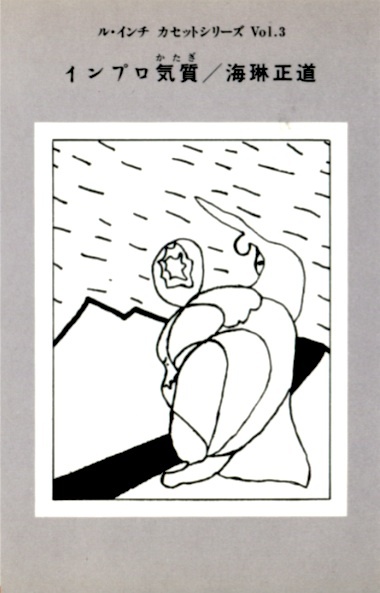 As for recordings, Lu Inchi has released a few cassette titles on their own label. Unfortunately, they all have been long gone and available nowhere for years. But rejoice. As a teaser, the first 50? 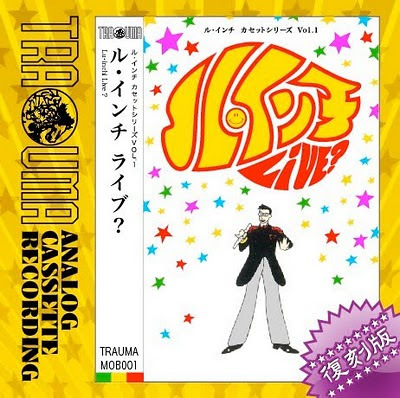 audience of the Aoyama performance will receive a CD-R duplication of their first release "Lu Inchi Live?". They said this will be the only time the album reissued as original form. Also the first solo recording of Mitama Masamichi called "Impro Katagi" ("Portraits of Improvisation"), which was originally released as one of Lu Inchi-related cassette series in early 1980s, will be also reissued as CD-R and for sale at the occasion. Do not miss the chance, unless you have the intention of waiting another 24 years. 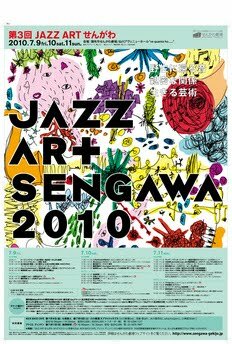 Many of you came here by searching about Jazz Art Sengawa so here's some update. 3-days ticket and 1-day ticket for July 11th (the 3rd and last day) are now sold out. But should not get discouraged. Advance tickets for the event are sold only limited quantities, and there will be a plenty of tickets available on the day of the concert. It looks like competition for ticket is going to be fierce - last year I saw people made long line in the Sengawa Theater office. So, if you want a seat, be advised to come early and ask the office about ticket (in Japanese or plain English - do not expect English fluency, as this applies to the most parts of Japan). Good luck. And unfortunately if failing to get tickets, at least you could attend free improvising session, held at Sengawa Avenue Hall. It's admission free - and actually quite an interesting event. Basically, there is no so-called professional musician for the session. The players are all selected from open applicants via audition. Three producers of the festival - Makigami, Fujiwara and Sakamoto - are to be a moderator. As for the Makigami's session, he decide to make a group out of 20+ players on the scene and let them play. The personnels are to be changed each "piece". Playing time of each piece is vary - roughly said it is about 5 minutes. It's like open improvisation workshop, sans any instructor (the moderators gave no advice - just made some short comments) and made me remember Derek Bailey's Company. I have witnessed the sessions in the past two years, and thought it was quite a refreshing approach for improvisation. You could see many young, aspiring improvisers perform, only this place, and Makigami said last year, this is the most interesting program for the festival. I agree with him. Again, this session is admission free, but be sure to come early. The seats are limited and the festival allows no standing. 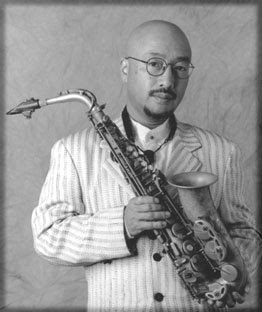 And anyway, in my opinion, Jazz Art Sengawa is the best festival of avant jazz or improvising music in Japan. 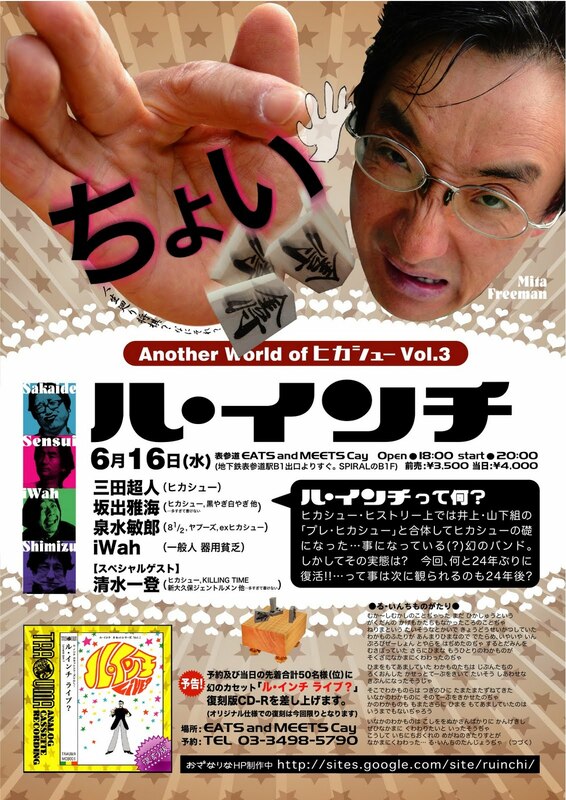 If you live in Tokyo area and interested in such kind of music, this event is for you. I wholeheartedly recommend it. 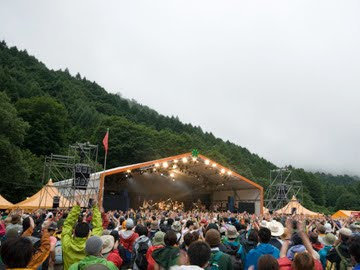 Smash Inc, the organizer of Fuji Rock Festival, officially announced the stage allocation for the acts. 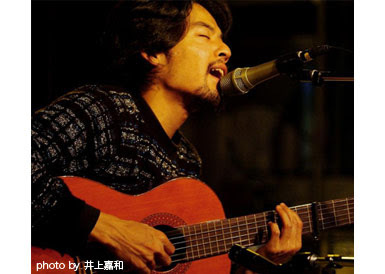 Hikashu will appear at Orange Court (capacity: 5,000), which they share with the bands like Zappa Plays Zappa, and Magma. The time table is still not available yet but I could give you one advice: DO NOT BE LATE. It seems that Hikashu will hit the stage very early, so be careful not to miss. Also, there's some useful tips for Fuji Rock in English. See here. Seun Kuti and Fela's Egypt 80 at Orange Court, 2009. Regarding Twitter, four of the Hikashu members have account and usually twitter a few times a day. Unfortunately they twitter only in Japanese, but if you talk to them in plain English, maybe you could get some response. Their accounts are as follows: Makigami - @MAKIBRI, Sato - @MASAHARUSATO, Sakaide - @sakaidesan, and Mita - @mitafreeman. Mita just made his account today! More reissues: Besides "Watashi No Tanoshimi" and "Hikashu Super Two", Makigami recently revealed that "Ningen No Kao" ("Human Faces") is now in consideration for reissue, tentatively planned for autumn release. The album, originally released in 1988, is regarded as one of the representative works of the band. It also have been hard to find for years so this will be very welcoming re-release.